With over 20 years of extensive knowledge in the Motor, Generator Rewind and Repair business, we can provide a 24 hour turnkey solution to your requirements, whether it be onboard a vessel, in our workshop or onsite. I.M.E regularly visit ships all around the world to carry out the onsite cleaning of large alternators and motors, that are too large to be removed or cannot warrant long periods of downtime, thus cleaning onboard is the only option. Using a class approved cleaning product, motors and generators with insulation resistance problems are often rectified by fully stripping down the set and carrying out a 2 part cleaning process, along with bearing and seal replacement. Within our workshop we have winding facilites for up to 4 tonnes for both AC and DC equipment, covering transformers, armatures, field frames, break and solenoid coils and AC stators. 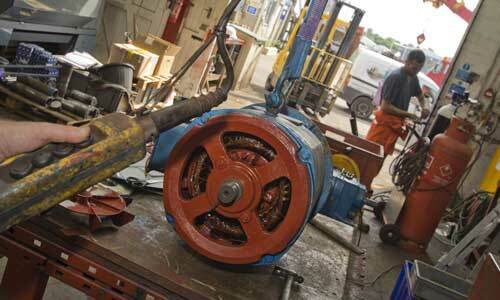 Any mechanical repairs are carried out by our machining department.